Do you have a grocery item that maintains a permanent on your weekly grocery list? Something you know you can make use of no matter what your weekly menu? Something that never dies a slow death in your crisper? Greens. They are always on my list, and they never go to waste. Kale, collard greens, swiss chard, mustard greens, spinach. I don’t discriminate, but I do limit myself to just one bunch. Ever since Rajat and I found out that we’re having a baby (yes, a little hungry desi baby! ), I’ve been a little more focused on making sure that I’m getting plenty of greens and protein. Being vegetarian, that first one is easy but the second can be a challenge. My favorite way to “get rid of” my greens is to make a pot of lentils with onions and tomatoes with the garlicky greens tossed in. I get to knock out a few birds with one stone. The lentils reheat well during the week and make for a quick, protein packed lunch over rice or with a piece of naan or a buttered roll (if you can get one, a buttered brioche roll is perfect) or a side dish for dinner. I like to rotate the type of lentil that I use – yellow split peas, channa daal, french lentils and pink masoor daal work well because they cook quickly and each offers its own nutty, hearty flavor which pairs well with earthy greens. Any greens works but I prefer fresh over frozen and something with a crunchy stem. Add a tablespoon of cooking oil, lentils, tomato, onions and water to a pressure cooker. * Pressure cooking times vary by cooker so check your cooker’s instructions. Heat a deep, wide skillet on medium heat then add about a tablespoon of oil. Add the mustard seeds (cover with a lid, the seeds pop) and when they start to sputter add the garlic and green chilis. Saute uncovered for 2-3 minutes until the garlic gets golden brown being careful not to burn. This will give the garlic a sweet, nutty flavor that makes this daal so decadent and enjoyable. Add the greens and cook until wilted, stirring occasionally and partially covered. Stir the greens into the daal. Add lemon juice then salt to taste and adjust with water depending on preferred thickness. Heating up tip: The daal tends to become solidified when you store it. Whisk a little bit of water into the leftovers if needed to get the original consistency. *Pressure Cooker Phobia? Add the oil, lentils, tomato, onion and about 4 cups of water to a saucepan. Bring to a boil then reduce heat to low and cook covered until the lentils are soft. You may need to add more water as the lentils cook. The cooking time varies by the type of lentil that you use and some may require overnight soaking. Lentils that don’t have an outer husk will cook more quickly. Preserving Greens: When you bring greens home, wash them, air dry or pat dry until mostly dry, loosely wrap them in paper towels then place in the plastic grocery store bag and store in the crisper. Also, if you buy your greens from a farmers market or CSA they’ll last a lot longer than grocery store greens because there’s less travel time from farm to your fridge. Cleaning and Chopping Greens: I find the best way to clean greens is to first trim a bit of the stems off then put them in a large bowl with cold water and swish them around so the dirt settles to the bottom. Repeat a few times with new water. I like to use the green stems but some people prefer just the leafy parts. The stems pack a nice crunch so I keep them around. Stack a few similarly sized leaves on top of each other then fold over two times placed vertically and run a large knife down the length of the leaves cutting into strips. Turn the strips horizontal and chop into small square-ish pieces. ND: We usually have it with roti or rice, but I have to say I was really surprised by how great a buttered roll dipped in this daal was for lunch. This looks lovely, like something I’d want to enjoy for lunch quite often! Congrats to you and your husband! How exciting! This recipe looks delish- I am now officially ready for lunch at 10am! ND: That happens to me most mornings! 10 am to 11 am is a bad time for me to surf food blogs! And thanks for the congrats. Congrats on your anniversary. Lovely news about the baby, Nithya. Congratulations! I love the sound and look of this simple dal. I add greens to dal too– even lettuce which tastes wonderful with split peas and cooks really fast, making it perfect for busy weeknights. ND: Wow, I never thought to try it with lettuce. I always always always have leftover lettuce from making salads which ends up going to waste. I’ll try it out with split peas next time. Congratulations!!! i love greens in my dal, i usually use methi and palak but swiss chard and mustard greens sounds grt , shud try sometime..
ND: Thanks! I love methi daal too , but I started using these when I couldn’t always get to the Indian grocery store to pick up methi leaves. Let me know if you try it out. Your soup looks lovely and comforting – yum! 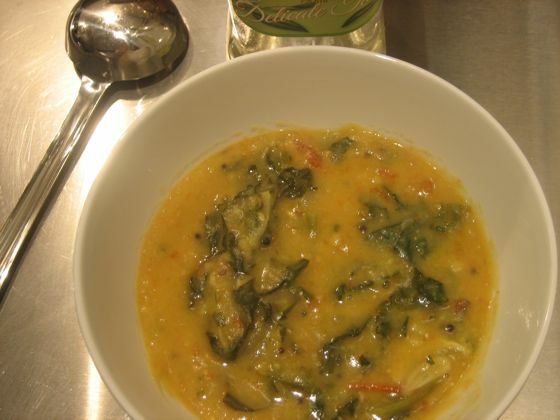 I’m a big fan of greens in lentils, my favorite is collard greens dal. i love dal because there are a million different kinds! i also put greens in kichadi for an all-in-one dish. Congratulations on the soon-to-join-you wonderful addition to your family! I wandered over to your blog from another one and glad I did. You have a wonderful virtual culinary home here! I love dal. Have it with everything and sometimes just by itself. It always shines no matter how you eat it and nothing is healthier than some dal with added veggies. Green are my favourite addition too :).